As the home of thoughtful gifts, notonthehighstreet bring together beautifully made products from the UK’s best small creative businesses. Discover everything from custom-made jewellery to original homeware, unforgettable experiences and deliciously different food and drink. When redeeming a gift voucher, the unique code stated on it will need to be entered at the checkout. 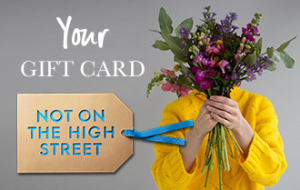 Notonthehighstreet.com gift vouchers can be redeemed only through notonthehighstreet.com. They must be redeemed within one year of the date of dispatch by us or our agents acting on our behalf and will expire after such date. When redeeming a gift voucher, the unique code stated on it will need to be entered at the checkout. Please see the full gift voucher and shopper terms and conditions.